Also serving communities of Point Pleasant Beach. There are 27 Assisted Living Facilities in the Brick area, with 3 in Brick and 24 nearby. To help you with your search, browse the 225 reviews below for assisted living facilities in Brick. On average, consumers rate assisted living in Brick 4.5 out of 5 stars. Better rated regions include Howell with an average rating of 5.0 out of 5 stars. Caring.com has helped thousands of families find high-quality senior care. To speak with one of our Family Advisors about assisted living options and costs in Brick, call (855) 863-8283. With a population of 75,000, Brick is New Jersey's 13th-largest municipality and the third-largest town in Ocean County. Brick has a thriving senior community, with adults over 65 representing nearly 20 percent of the population. Current residents and newcomers can choose from 21 assisted living facilities in Brick and the surrounding area. To meet licensing requirements established by the New Jersey Department of Health, these facilities are evaluated regularly. The cost of living in Brick is 16 percent higher than other U.S. cities and 17 percent lower than the rest of New Jersey. Housing costs are 40 percent higher than the average American city, but prices for utilities, groceries, health care and transportation are about the same. New Jersey has favorable tax rates on retirement income. Social Security retirement benefits aren't taxed, and distributions from IRAs and 401(k)s are eligible for tax exemptions up to a certain dollar amount, which leaves extra money for essential expenses. Seniors in Brick must endure colder winters with average lows around 24 degrees and humid summers with highs near 85. The area receives slightly more rain than the average U.S. city. When it comes to annual snowfall, seniors catch a break since Brick receives less snow than most cities in New Jersey and other parts of the country. Brick Township is safer than 47 percent of U.S. cities. Property crimes are slightly less common compared to other boroughs in New Jersey. Violent crimes affect less than one in every 1,000 residents, which is about 2.5 times lower than the rest of the state. For seniors who live at assisted living facilities in Brick, it's easy to get out and about. The Garden State Philharmonic and Count Basie Theatre are nearby along with numerous museums and seasonal attractions along the Shore. Seniors also enjoy day trips to Philadelphia, Manhattan and Atlantic City. Brick offers an array of community resources to support its senior population, including Brick Township Senior Outreach Services, an organization that improves access to health, education, social and supportive services. Fitness classes, crafts and workshops are held at the Brick Senior Center. Assisted Living costs in Brick start around $0 per month on average, while the nationwide average cost of assisted living is $4,000 per month, according to the latest figures from Genworth’s Cost of Care Survey. It’s important to note that assisted living rates in Brick and the surrounding suburbs can vary widely based on factors such as location, the level of care needed, apartment size and the types of amenities offered at each community. Adults who need help with activities of daily living can apply for financial assistance through Medicaid. 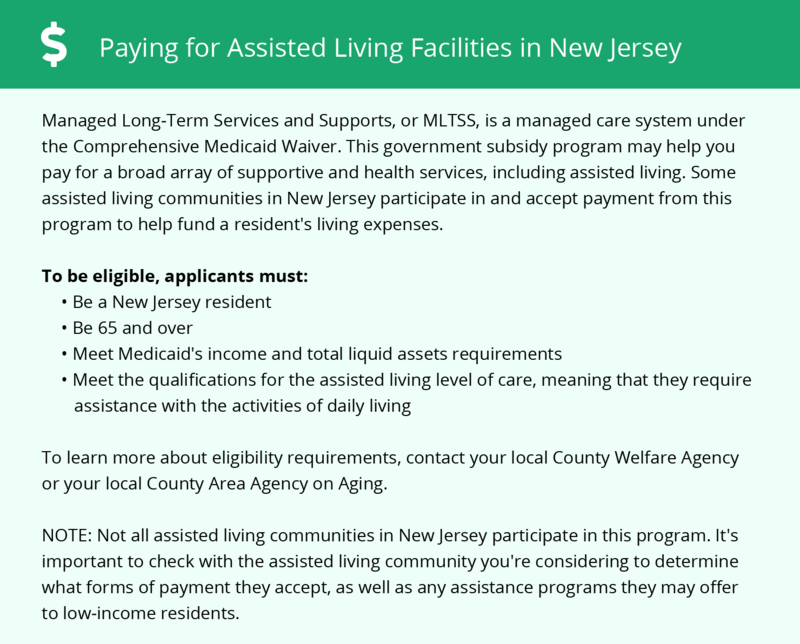 The state's Managed Long Term Services and Supports program covers the cost of personal care and assisted living services. 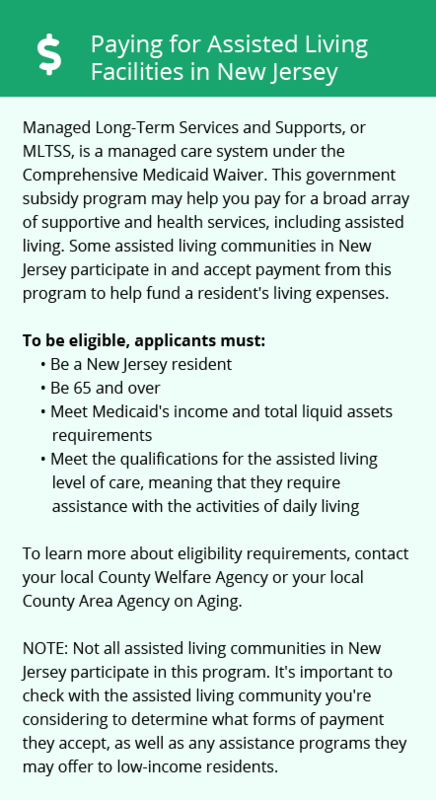 Seniors can apply for this program through their local County Welfare Agency or Area Agency on Aging. Brick and the surrounding area are home to numerous government agencies and non-profit organizations offering help for seniors searching for or currently residing in an assisted living community. These organizations can also provide assistance in a number of other eldercare services such as geriatric care management, elder law advice, estate planning, finding home care and health and wellness programs. To see a list of free assisted living resources in Brick, please visit our Assisted Living in New Jersey page. Brick-area assisted living communities must adhere to the comprehensive set of state laws and regulations that all assisted living communities in New Jersey are required to follow. Visit our Assisted Living in New Jersey page for more information about these laws.